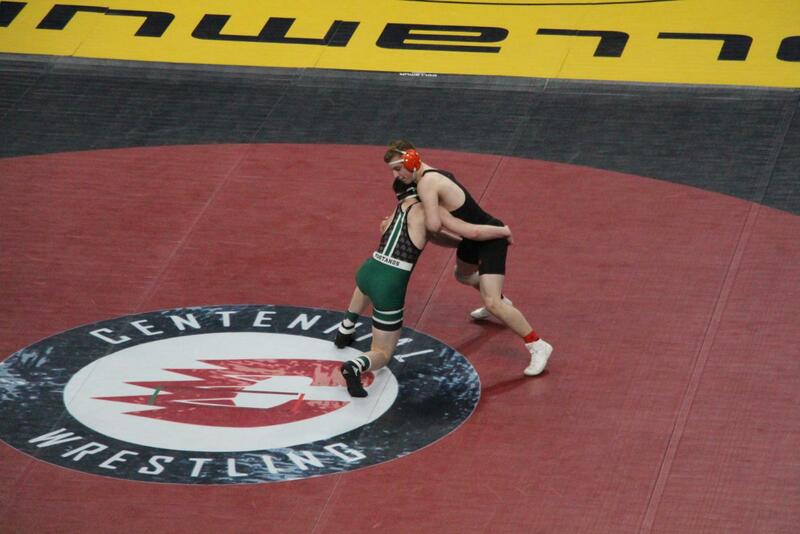 Early this month was the Minnesota State wrestling tournament, held at the Excel Energy Center. This year two South wrestlers, brothers Brian and Daniel Avre, both qualified. Wrestling is a family tradition for them, and they have both been wrestling since around five. “It’s been a lifelong run for both of them. They’ve both been wrestling their whole lives and they just really put in the time,” said their coach Joe Morgan. 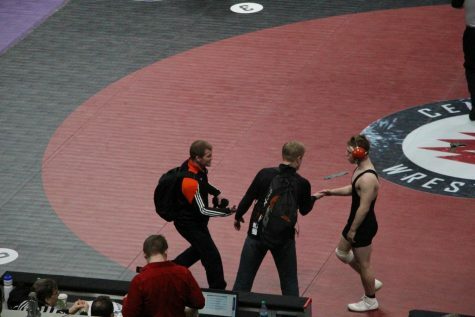 February 28th to March 2nd was Minnesota’s high school state wrestling tournament. This year two South High wrestlers qualified for the competition, brothers senior Brian Avre and sophomore Daniel Avre. Wrestling is a family tradition for the Avres, which is driving the passion the brothers have for the sport. “It makes it a lot easier because everybody around you knows what’s going on,” said Brian Avre about his family. “It’s really fun that we all have this connection. It’s something that we’ve been doing for a long time,” Daniel Avre elaborated. Both of the brothers have been wrestling since around the age of five. Daniel Avre explains that growing up with a brother who takes part in the same sport is “ pretty fun cause we always go back and forth about like who is the better wrestler, and our records, achievements, and stuff,” said Daniel Avre. “We always compete. Even just running or something, we always push each other, and that’s something I am going to miss next year when he goes to college,” said Daniel Avre. “Just like anything you do in life, especially as a young person, it’s a huge thing to have the support of your family…The amount of time family spends not only participating but just being in support of their kids has been a huge influence,” said the Avre brothers life long wrestling coach, Joe Morgan. Morgan is currently the head assistant coach for South’s team but he has known the boys from a summer wrestling program where he started coaching them around the ages of 7 and 5. The South High wrestling team has a tight agenda. “It’s a lot of staying in shape, eating right, and even on the snow days we didn’t miss practice,” said Brain Avre. “Brian, who is our senior captain, he has not missed practice for the last two years. Not one day of practice,” applauded Morgan. With such a demanding obligation, it is essential to find ways of keeping themselves motivated. “In my opinion, it’s a huge mental grind and it takes a lot of perseverance. There’s a lot of ups and downs, good days and bad days. It’s definitely tough mentally,” said Morgan. “Sometimes I just relax and sit back and think about what I’m doing it for; the goals I have and what I want to accomplish,” explained Daniel Avre. “Plus, Daniel dealt with some injuries this year, so he only really got to wrestle for half the season, so that’s also a little tough… you’re kind of behind in terms of conditioning and working out,” said Morgan. Recognizing what you enjoy and how you benefit from commitment is also important. Brian Avre said that the main benefit of wrestling in his life is the integrity it has taught him. Daniel Avre said that it has made him a very hard worker, as well as more diligent. “It pays off in the classroom because I know what it takes to work hard,” he explained. The state competition was held at the Xcel Energy Center in Minneapolis. The Xcel can hold thousands of people, which was the case at this year’s state wrestling tournament. “It’s something that you have to really mentally prepare for because it’s probably the only time in your life, especially up to that point, that you’re going to get the opportunity to do that,” explained Morgan. This was Brian Avre’s first time going to state, where he won two out of two of his rounds. “There’s like thousands of people there watching you, which gives you excitement and you’re just ready to go,” said Brian Avre. “This year I wasn’t so nervous, but still being on a big stage with all the lights and the crowd, it’s a little nerve racking but once you’re up there you get used to it,” Daniel Avre said. He has gone to state before but lost during his first round this year. “There’s so much failure involved in our sport… You’ve got to learn how to deal with that failure and pick yourself up every single day and get through it,” said Morgan. Brian Avre is the senior captain of the team this year. However, “Daniel is not a captain as of yet, he is just a sophomore, but he’s a leader on our team also,’ said Morgan. Following graduation, both boys have plans and hopes to continue with wrestling into college. With the amount of support they have, as well as the work they continually put into it, Morgan was hopeful and supportive of the prospect. Since Brian Avre is a senior this year, Morgan said that they’ve had serious discussions about him continuing wrestling. “He certainly has the ability,” said Morgan. As for sophomore Daniel Avre, continuing with wrestling past high school has been a goal since he was young, but does not have any explicit plan in place as of yet. “There’s an old quote that in ‘In life, once you’ve wrestled, everything else is easy,’” said Morgan.